Thomas Piketty’s new book, Capital in the 21st Century, or “Capital” for short, has made a massive impression in the media. He has been elevated to something of an economic super-star status. People who never were interested in economics have joined reading groups of Capital, and an unprecedented number of articles has appeared outside of the “business” pages on the question of economics. I’m going to review some of the content of this book, and give a brief explanation of what Piketty has done. I’ll focus on some of the contributions that I think are useful and important. Then I’ll describe some of the problems that I think are inherent to Piketty’s approach. Piketty’s work is a real magnum opus. In fact, the contribution in terms of data is so large that it’s important to understand this is not really the work of one person, but an international team of researchers over a long period of time which has amassed an unprecidented amount of historical data on economics in one place. One thing to keep in mind is that this work really was made possible because of advances in computers, and could not have been undertaken in Marx’s day (late 1800s), or even in Kuznets’ day (mid 1900s). We are in an era of big data which opens up new vistas for historical economic research. Piketty begins his book reviews of two classical political-economists, Ricardo and Marx and one modern political-economist Kuznets. The first two are rather odd to bring up in modern discourse, simply because modern neo-classical economics has rejected political-economy and focused on complex mathematical technical models, often with very little empirical data. But both Ricardo and Marx made large scale predictions about the internal dynamics of capitalism which lead to predictions of certain kinds of potential problems (or as Marx would have put it, internal contradictions) something which is generally anathema in modern economics where capitalism is for the most part assumed to magically yield the best outcomes, though perhaps with a bit of fiddling (depending on whether one is Keynsian, neo-Keynsian, or neo-classical). Kuznets stands out quite a bit in having taken a much more long-term historical data-driven perspective than almost any of his contemporaries. It is in the context of making big predictions about systemic behaviour over the long term that Piketty wants to situate himself. He would also like to situate himself again in the context of *political*-economy rather than just economics. This is in fact a fairly big break with the mainstream. Piketty’s core argument is that there are three major factors which dictate levels of inequality. The first of these is a “convergent” factor, which is already widely held by economists to be so (for instance, it has often cited by Krugman as the key element of importance). This is skill-sharing and knowledge diffusion. The idea is that development requires access to high levels of technical knowledge or there is no capacity to make use of advanced technological solutions. This tendency works itself out both internally (people can’t get jobs if they are not skilled) and externally, (countries can’t develop industries for which there are no skilled workers). This leads to low productivity and consequently divergence. The second is a “divergent” factor. This has to do with spread in income. “Super-managers” who have exceptionally high salaries are now a big cause of rising inequality. This is especially true in the United states. We’ll return to this factor later, in discussing the analytical role to the means of production, wage labour and capital. The third, and as Piketty contends, the decisive factor, is the rate of return to capital as relates growth. This is put forward in the simple inequality which he terms r > g. That is, inequality will expand if the rate of returns on capital are higher than the rate of growth of the economy. Finally, at the end of the book, Piketty has a section on what might be done to avoid a situation where we find ourselves with ever-rising inequality. Since Piketty has put forward the hypothesis that the central decisive factor which will lead to inequality in the coming era is the rate of return to capital versus growth of the economy, this suggests a fairly simple remedy. That is, that we can simply introduce a wealth tax, to ensure that r does not exceed g. Such a tax would have to be a globally administered tax so as to avoid capital flight of course. He also puts forward that the global wealth tax would have a secondary effect of making total wealth more transparent thereby enabling greater democracy. Piketty also has something of a defence of progressive income taxation, despite it not “curing what ails us” in terms of r > g. He contends that it does have other beneficial properties, among which is the amelioration of the first “divergent” factor – super managers. While Piketty’s work is very interesting, the data meticulously curated and the information very useful, there are a number of serious problems that we should take in turn. In the introduction where Piketty compares his work to Marx’s Capital he puts foward that Marx’s central hypothesis was a doomsday message. Basically, that all things being equal, in a somewhat idealised capitalism designed to look primarily at *internal* problems (or contradictions as Marx might have put it) capital will always tend towards “infinite accumulation”. Piketty proceeds to give Marx a right kicking for this silliness, showing with graphs how this didn’t come about at all. The problem which Piketty is nevertheless faced with is that from that very data which he contends, and accepting his own internal argument regards the rate of return and growth, Marx’s prediction seems to hold very nicely provided given we exclude two rather important events *external* to the internal dynamics of capital. That is, the two world wars. 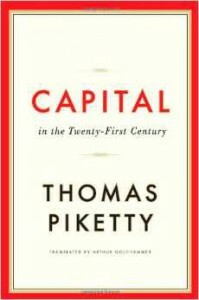 Piketty probably should have read chapter 24 – but it’s clear from the critique that he really has never read Capital at all, and later in interviews he admitted to such. This is a mere irritation however, there are more substantial problems in the approach that Piketty uses. Primary among them is the *aim* which is implicit in the entire work. So Piketty discards possibilities other than Capitalism a priori. At this point it’s merely a question of *which variety of capitalism* we should seek. He very clearly articulates the kind he wants – one based on meritocracy, where inequality doesn’t grow without bound, and where dynasty and inheritance is eliminated as a major factor. From this point of view, there is quite a lot of sense to his proposal of a wealth tax to avoid r > g.
r > g means inherited wealth grows faster. But why the focus on the inherited? Inequality is driven in this equation to divergence by any holder of capital, even if they won it in the lottery, or bootstrapped from a lucky guess on entrepreneurialship or the stock market. One needs to take a step back and ask why we should care about inequality in the first place? For Piketty it seems it is a moral revulsion against unmeritocratic capitalism. For socialists, inequality itself is a problem – it makes for an undemocratic and inefficient system where interests diverge leading to serious social instability – regardless of the content of meritocracy. Would everything be grand if we had confiscatory inheritance tax? What if we still had some people starving and a vastly rich super class? How is it better to start everyone off at the same level if we still experience vast divergence? Significant research has demonstrated that elevation has all sorts of deleterious effects in its own right – making social strife a problem, causing health concerns, increasing crime, and making the rich lie, cheat, steal and feel entitled to break the rules and the law as they come to feel that they are simply better people. Further, motivation, especially in intellectual endeavours can be directly harmed by material incentives as a number of studies have shown. So then what then is the value of all this meritocracy of money in the first place? It certainly shouldn’t be elevated to a principle without first interrogating whether it benefits the broad mass of the population as a whole. One might point out how utopian such a wealth tax is in terms of its political implementation. How are we going to acquire a movement for a world government actually capable of exacting this tax is left up as an exercise to the reader. However, perhaps we who are socialists should not be so hard on this point, considering the substantial difficulties we ourselves face in obtaining the political-economic power to enact our own programme. There is another serious question that arises from Piketty’s approach. This is the definition of capital itself which Piketty uses. When carrying out empirical research it is rarely the case that one has precisely the measurement variables one might want in order to carry out an analysis. Very often one has to make do with sufficient proxies. In the case of Piketty, he has used the nominal value of wealth in money terms, and it’s ratio to the national income, again in money terms. Marx’s definition of capital is very different – it is a relational definition. Capital is not merely wealth, but wealth which is employed in the process of production with the aim of obtaining profits. This *circuit* of capital is crucial to understanding the notion of capital. As an example, supposing I have a large house in the countryside which I live in. This is not in fact capital. It becomes capital only if I start running a B&B out of it. The money value of capital used in the circuit can fluctuate due precisely to the conditions of profit which can be obtained in production. And it is this holistic analysis that is absent from Piketty. This is a serious problem because Piketty wants to be able to talk about Growth in the same terms that he talks about the return to capital. However his growth requires a physicalist interpretation in terms of utilised physical capital – while he designates it with its monetary value, something which it turns out requires knowing the rate of profit in the first place. This problem of understanding growth in terms of the rate of return while it needs to be in terms of physical capital has been known for ages, and is called the Cambridge capital controversy, which was decisively won by Sraffa and Robinson and then dropped utterly from history because of how inconvenient in turns out to be for neo-classical economics. Yet Piketty dismisses the controversy in his book without really understanding what it is in the first place, and makes the bold claim that the anti-physicalist side won, despite the fact that Sameulson, the chief architect of the opposing argument conceded in 1966. This seems a real problem for his central claim of divergence, the r > g thesis. In summation, I’ll just give a few thoughts. I think that Piketty has broken some useful new ground in returning us to the idea of political economy. I also think the idea of long scale empirical research is a vital tool in interrogating the dynamics of capital. However, the book is also a defence of a “variety of capitalism” which Piketty feels we should adopt based on meritocracy dictating how much we earn within capitalism. Firstly, I think it’s unlikely that the types of reforms that Piketty would like to adopt could come about naturally within a system of such deep inequality due to the massive strength the capitalist class has in pushing democracy in the directions it would like to go. Even if such concessions *were* achieved, I believe they would prove unstable. Further, the only counter experiences Piketty can point to involve epic war. To me, this seems the most likely way that a world government with a uniform tax rate could actually come about. But there is a more important reason that I would like to look beyond Piketty’s variety of capitalism. I think this concession is unjustified and that there is still a real potential for democratic and social control over the process of production and utilisation of the social surplus which does not require attempting to regulate the edges of off of accumulation.